Today at NAB 2018 we met with the team at Kinefinity and they gave us our first look at the new MAVO & MAVO LF. Whilst we didn’t actually get to use the cameras they do seem well built. Both cameras are tiny and fit in the palm of your hand. Kinfinity told us that both cameras haven’t been in development that long, which was a surprise to hear. Building a digital cinema camera is no easy feat, but Kinefinity looks to have come up with two good products that may well surprise a lot of people. See below for a recap of the specs. The MAVO is expected to ship at the end of April. The MAVO LF is yet to be priced and is estimated to ship at the end of October 2018. Kinefinity also announced a new set of full frame cinema prime lenses that are being made by NiSi. The set which includes 25, 35, 50, 75 & 100mm T2 lenses retails for only $11,999. This is extremely cheap for full frame PL mount lenses ($2399 USD each). We did get to have some time with these and they seem like really good quality for the money. Whilst Kinefinity could not confirm this, we strongly suspect they are re-housing of the Bokkelux Cine Primes. They have a good weight to them and we found the focus rings had a really good feel to how they worked. Nice and smooth movement. Thinking about ordering one? 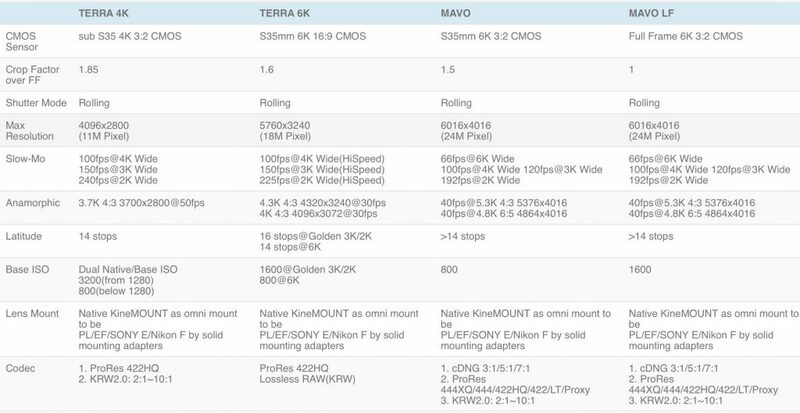 ordering a Kinefinity camera is not for the faint-hearted. Be prepared for delays and with no customer service base outside of China so repairs and tech support may be a difficult process. It’s also hard to convince a lot of clients to use a camera that they have never heard of. Still, Kinefinity is making big moves in the cinema world, we hope to get one in for review as soon as possible.